The Edwardian Metal Picket Fencing System is similar to the Heritage fencing system, however, the Edwardian pickets vary in length with longest in the middle and shortest at the ends of each panel. This type of fencing system is made of steel rectangular hollow pickets, and also resembles traditional wooden pickets. The standard heights for the Edwardian Metal Picket Fencing System are: 900mm, 1200mm, 1500mm and also 1800mm. Also, there is a variety of picket tops to choose from. Furthermore, your fence can be powdercoated any colour from our choice of over 150 different colours to choose from. With little to no maintenance, you can have a great looking fence. 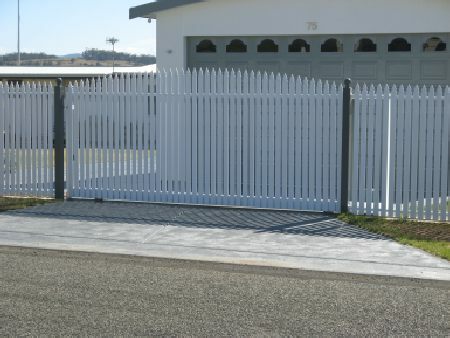 Fence and Gate Supplies’ Edwardian Metal Picket Fencing System is a strong, durable and also an attractive alternative to timber picket fences. Its design allows traditional or modern appearance to be enjoyed for many years to come, without painting or maintenance. Edwardian Metal Picket Fencing – A beautiful and also an affordable solution. It’s the ultimate combination of strength, beauty, and also durability.